Above Grade Level provides in-home, 1-on-1, world class tutoring in math, English and more. Our expertly-developed, customized, proven curriculum is so effective that we 'guarantee' our students will improve by at least 1-grade level or 10%. With over $1M invested in our teaching material and 10,000s of student success stories over 30 years, new franchisees can have every confidence in their future success. In 2-weeks, you'll learn how to run a thriving tutoring business. Low upfront investment. Real Rewards True success comes from doing something you love. Find your purpose helping children improve their grades, confidence, and potential - and make a real impact in your community. Make your mark with an Above Grade Level territory that’s exclusive to you. Turnkey System Our proprietary tutoring curriculum has helped 10,000s of students, over 30 years, get better grades. When it comes to pedagogical power, we don't skimp: We've invested over $1M into our curriculum's development (which is always on-going). It is so effective that we GUARANTEE a minimum of a full letter grade improvement for each of our students. We’re also every bit as committed to the success of our franchisees - providing all of the proven tools and support you need to grow your business. High Growth Finally, a business that offers money and meaning, in perfect synchrony! The nearly $5 billion supplemental education market has grown by 10x in just 10 years, according to The Wall Street Journal's SmartMoney Magazine (Nov. 2011). Secure your future with a recession proof business that will stand the test of time. Low Overhead An Above Grade Level franchise is easy to operate. 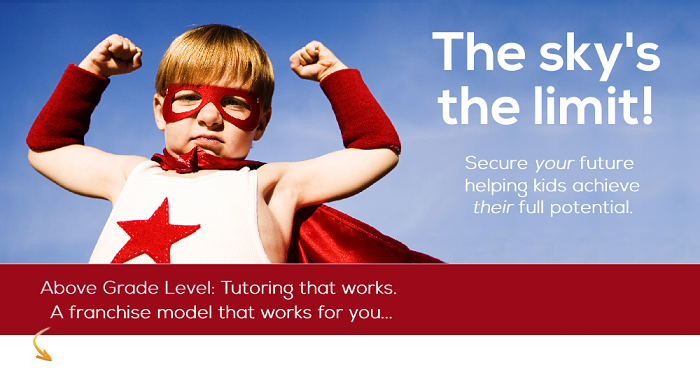 Your tutors offer one-on-one in-home tutoring, meaning you run your business from home. Our low startup cost, low maintenance, quick ramp-up, and high reward model puts Above Grade Level in a class of its own. We also provide you with 100%, on-going support every step of the way. Helping you succeed is what drives us!